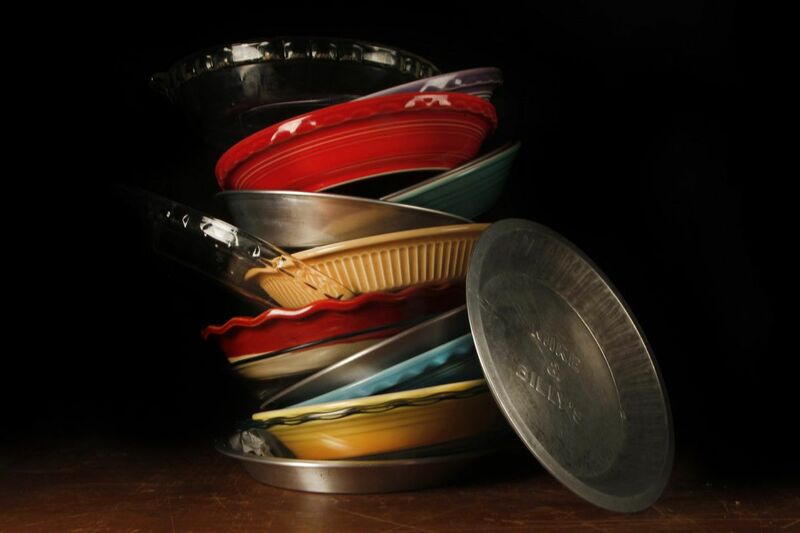 A collection of metal, glass and ceramic pie dishes. Q: Here comes another holiday season, and I'm dreading it. Years ago, I mentioned to somebody how much I liked a particular black-and-white, spotted cow mug I found at a yard sale. It went with the black-and-white theme of my kitchen. Then somebody gave me some cow salt-and-pepper shakers, and now I can't get past a birthday or Christmas without getting as gifts spotted cow cups, plates, calendars, figurines, T-shirts, hats, aprons. I am so grateful for the thoughts, but my kitchen is now completely overrun by spotted cow things. Eventually, I want to downsize, so what should I do with this accidental collection, and how can I politely say to my friends and family: Please, no more cow stuff. A: In this one letter, you bring up many great topics for the holidays, including gift-giving advice, decluttering, and how to manage an unruly collection. Not to mention how to be gracious when receiving gifts you don't love, and how to be discerning when it comes to keeping a gift and displaying any collection. First of all, I can see how your collection grew. By displaying every one of your latest acquisitions, you sent your friends the message that you like the cow theme, and this became a convenient gift-giving idea. With any gift, your only obligation is to thank the giver sincerely. You don't have to display or even use something if you don't like it. I don't keep anything in my own home, gift or not, that I don't use or enjoy. Your goal of downsizing is a good excuse. Use this holiday season to mention your plan, and how you are going to be doing a deep decluttering before the end of the year. No need to explain further, unless somebody asks specifically if you want another cow mug. Simply say, "I appreciate you thinking of me when you see something like that, but my collection is plenty big, so, no, thank you." And suggest going out for coffee instead, or some other inexpensive gift of their time. Enjoy your season and good luck with this. Have a design dilemma? Jennifer Adams is an award-winning designer, TV personality, and author of the forthcoming book "Love Coming Home." Send your questions to AskJennifer@JenniferAdams.com, or, for more design ideas, visit Jennifer's blog on her website at www.jenniferadams.com.